The Buyer: A group of 3 investors contracted with DVS to find a company to purchase. Of these investors, Mr. Melvin Deal was chosen to be the future operator of the acquired entity. Melvin is an award-winning facility manager for Saddle Creek Corporation, a large 3PL company with operations throughout the US. The Seller: Midwest Recycling Center or “MRC” (midwrc.net) is a leading recycler of electronic waste or “e-waste” in the states of Missouri, Kansas, Illinois, and Iowa. 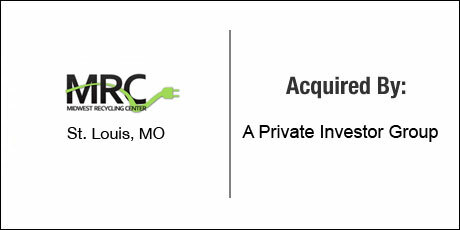 MRC collects any item that requires a cord or battery to run it, and then either refurbishes and re-sells the item or breaks it down into commodity components. MRC Recycling is one of the few recyclers in the state of Missouri that have achieved both R2 National, and Level 4 State certifications. This ensures that when clients recycle with MRC they can count on an audit trail for material handling as well as identity theft prevention and protection. The Close: DVS contacted MRC on behalf of its clients and quickly determined that the company was an extremely attractive candidate based on Melvin’s skill set and the relative size of the company. DVS crafted a structure in which the sellers were able to achieve their desired valuation while also appropriately sharing the risk in such a rapidly growing entity. DVS then assisted with the lengthy financing approval process, contract negotiation, and comprehensive overhaul of the risk management strategies of the entity to position the team for success post-closing.